Who says that having two kids would make you feel irritated and drives you mad when it comes to the selection of the right bedroom design idea? If you have more than two kids, you would be equally mad and confused. Often times, making younger kids share a room becomes quite common for many parents. This can be because of a lack of space in the house (like, living in an apartment) or because they have a huge kids room that can easily accommodate all the kids. If you think this is the case, you must definitely adopt the furniture and design idea that we are presenting. Though it is designed for 4 kids, you can utilize it equally well if you have 2 or 3 children in the house. This theme utilizes two colors, beige and lemon green which make it look quite classy and helps in ensuring that the children don’t really feel any issues in sharing a room if they have to. Utilize two walls in the room. These walls need to be adjacent to each other and must be utilized in half. You would either have to buy a big furniture unit or get it custom designed for your kids. A customized design is always a more preferable idea that anything else. First start with this custom wall unit. 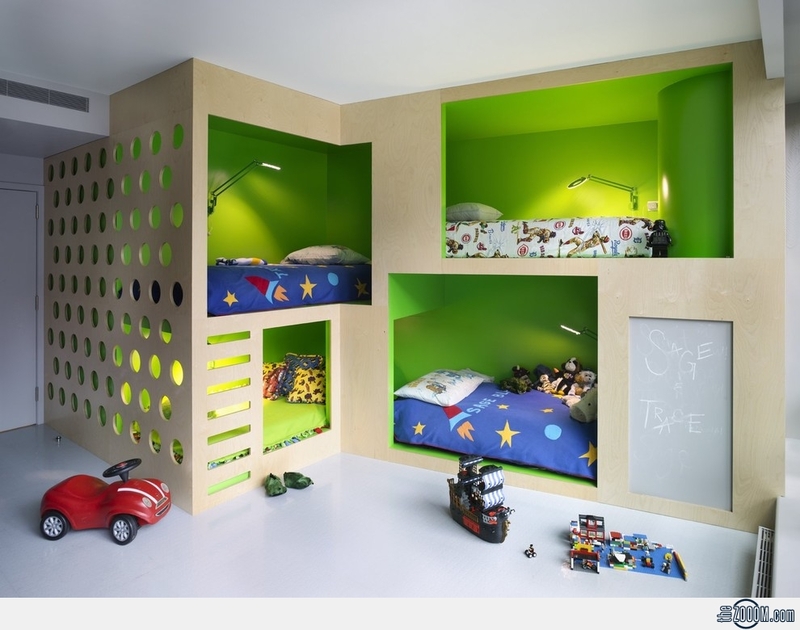 It should ideally look like a simple wall unit that comes with 4 unique spaces for the kids to sleep. You must have definitely watched the famous Japanese animated series Doraemon with your kids. Here, the robot cat Doraemon sleeps in a closet like space. The space we are talking about here is also quite similar. However, it would not come with a sliding door. The interior of the wall unit must be painted in a very rich but bright lemon green. For the mattress and linen of the 4 beds, you have to focus on two colors that match well with the theme. For two kids, chose a white with blue accents theme while for the other two, chose the blue with white accents theme. Make sure that each of the sleeping areas comes with a lighting system of its own and also ensure that the areas are big enough for the kids. Instead of getting 4 beds for the room, you can follow this theme and save a lot of space as well. The rest of the room can be utilized by the kids for storing their things and also in studying or playing. You can keep 4 separate cupboards and study table sets for the kids in different colors in different corners of the room. However, one thing that you have to pay attention to is that this idea should be utilized only when you have a bedroom that is big enough for making all the four children sleep in peace. We are restricting the sleeping space and increasing their activities space. If you only have two kids, this idea would work in a smaller room as well.